This is something very well established tat every one of us always look for the resources to safeguard our valuables. You can not just put everything in your bank’s locker as you would require them frequently. So in order to this, we go for many options and choices, we buy safe cabinets, electronic lockers and other stuff. But one thing quite scary about them is that they are just too much expensive. Electronic lockers range to thousands of dollars. But its nevertheless a bad idea to go for some indigenous home created ideas, and you can also take help from the pallet recycling as it has not disappointed you so far. So you can just keep the expectation level high like before, and just think of upcycling the pallet wood recycled storage chest. A wooden chest is something that is coming since ages. I remember giant wooden chests at my granny’s house, that same tradition is going to be revived be upcycling the pallet wood. Having a holistic approach we can not go beyond the limit of expertise that would be used here. The basic idea of pallet wooden chest is just shown right here in these pictures to give you guys an idea that how your final product is going to look like. 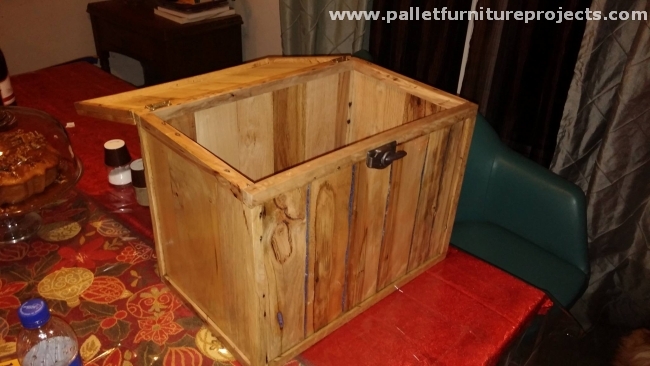 Well this is a huge rectangular box shaped wooden pallet chest along with a vintage lock that is apparently enhancing the outlook of this pallet wooden chest. And the beauty of this box lies in the fact that it is totally recycled using some raw pallets. The pallets which were lying idle in our backyard or may be we got them against a very minor cost. Cost however is below the expected one, but use it to the max. 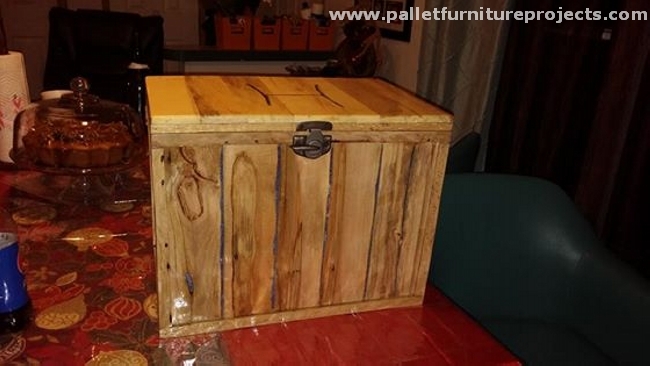 preserve a huge amount of your valuables in this pallet wood chest.